The Westminster was designed in 2001 right after the highly successful Classic Reel. I wanted a reel that would be a 19th Century classic, easy to maintain, and certainly lighter weight for shorter rods. Like the Classic, the Westminster Reels have internal self lubrication, single screw take down, and firm adjustable drag tension on a click pawl and cog system. The Brown Trout is an option that is very eye catching yet still a traditional design and the first reel to be grabbed at shows. The Two and Three Quarter inch Reels: This group of reels vary in width and are best for the small or medium size rods for stream fishing for trout. 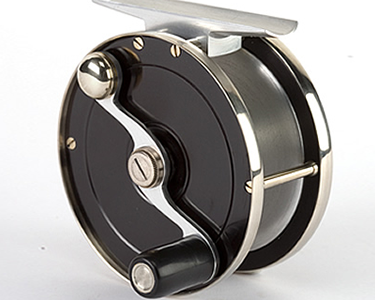 The Three inch GW 305 is the typical five weight reel for river fishing for trout. 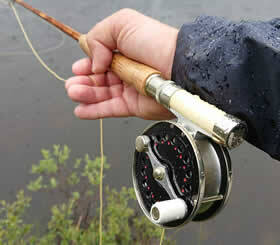 The 306 reel is for medium and long cane rods or that special graphite or classic glass rod. The extra diameter is great for faster line retrieve for trout and bass. Westminster Reels come with warranty and maintenance paper in a hand made draw string leather bag.